There are no rules that say a corporation has to have a program to support deployed military personnel, so when a company wants to send freebies to service members overseas, it’s time to get excited! After all, a freebie from a company means you can curate another care package of your own! 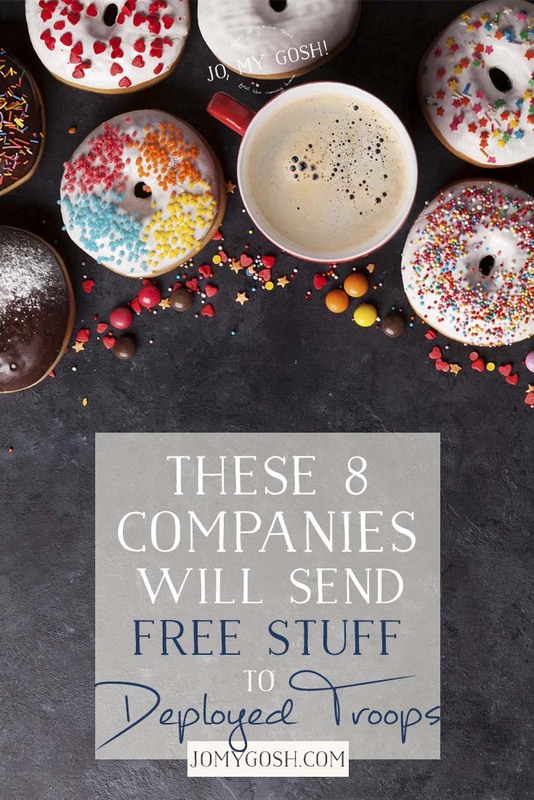 Below you’ll find a list of eight companies that will send free stuff to deployed military members. You might be surprised which companies are included in this list! A quick note about free product programs: Programs come and programs go–sometimes quickly. This list has information that is correct and researched to the best of my ability at the time and date of publishing. I have used some of the programs on this list but cannot personally vouch for all of them. If you have, let me know in the comments! I’d love to know about your experience! Finally, I have not been paid by any of the companies on this list– I’m just sharing this info because I think it’s great for the military community! Community Coffee – Community Coffee, a family company that’s been around since 1919, has the Military Match program that will double the coffee you send to your deployed service member! Buy and ship four bags of coffee to an APO/FPO or military base address, and Community Coffee will add another four bags of coffee and a mug for free! Dunkin’ Donuts – It seems America runs on Dunkin’… even overseas! On the “Contact Us” form, select “Military Coffee Request” for your category. Then add your contact information, plus the APF/FPO of your deployed service member to enter him/her into a lottery to win a case of Dunkin’ Donuts’ ground Original Blend coffee. Green Beans Coffee – Active duty military members (and full-time National Guard & Reserve members) can sign up for Green Beans Coffee’s Cup of Joe for a Joe program to receive a free cup of coffee. Green Beans provides very clear instructions for signing up. If you’d like to contribute a cup, you can buy a cup here. Hershey’s Chocolate – “Wherever you go, no matter how far, you’ll always see a Hershey’s bar!” Hershey’s makes good on their old jingle by sending a Hershey’ care package to overseas military members with APO/FPO addresses. Use this link, fill out the form, and send your sweetie some sweets. San Francisco Bay Gourmet Coffee – The Nominate A Soldier program from the Rogers Family Company allows you to nominate a soldier overseas to receive some free coffee. Simply fill out the form and coffee is on it’s way. Starkist Tuna – Starkist has a “Tuna for Soldiers” program that will supply Starkist Tuna pouch products to deployed troops with overseas military addresses. Send an email with your service member’s name and APO/FPO address information to consumeraffairs@starkist.com. Zippo – By heading to the General Inquiries page, you can send Zippo your deployed service member’s service email and APO/FPO address. They’ll send a free lighter. Some folks have reported that Zippos sends a care package or more than one lighter! BuildASign.com – Okay, okay… This company doesn’t send free stuff to your deployed service member, but they will send you free stuff for when he or she returns–BuildASign.com provides free “Welcome Home” banners! Choose from a variety of templates for a free 2’x4’ or 3’x6’ banner or 18 x 24 jumbo card single-sided sign to give your loved one the welcome reception they deserve. working along side the American Air Force, Army and Marines on Operation Inherent Resolve (Op Shader for UK). One of my American partners pointed me toward your site. I was wondering if you know if these company’s would send there gifts to out to support “the Scottish guys” as well. You might need to contact the companies directly. I am training for NPC bikini competition in November, and was wondering if you would send me a T-shirt, and possibly sponsor me once I get closer? I am a huge fan of the company, and products! I would love to be an ambassador for you at Golds Gym, Lifetime fitness, and Retro fitness in Raleigh NC where I train. I am active duty Air Force, and I have deployed twice. I am also going to college at the University of Mount Olive. “Welcome to Support Vehicle, we are based on the South Coast of England and provide a FREE passenger experience for children with life – threatening and limiting conditions in an American Police Interceptor”. As more businesses support our good cause (with vehicle support and services) the more FREE services we can offer to those who deserve it most. We now provide a FREE wedding chauffeur service for our troops. This includes veterans and regular reserves. Our FREE wedding chauffeur service is not just available to British troops but also American, Canadian and other allied serving, regular reserves or veterans getting married in the United Kingdom. I emailed starkist and they gave me this link http://starkist.com/contact-starkist to put in the request. Figured that might help others save an extra step on emailing/contacting twice. ps. Just found your blog recently and love it! This site is awesome! A great resource for military spouses. Thanks for the mention- we’re proud to provide a way for American’s stateside to thank deployed Service Members overseas with a cup of coffee and personal message. Thank you for your inquiry about the StarKist Tuna for Soldiers Program. Please visit our website http://starkist.com/contact-starkist for this request. These requests are fulfilled on an individual name/address basis. Again, thank you for this blog! Bless your heart! Love your blog. Dunkin Donuts is sending coffee to my son in Afghanistan. Hershey’s is sending a box too. My son is a battery commander and will be so happy to share the goodies with his troops. Would Never of know about these options without you. Deployment to Middle East looking to get the Marines all Christmas presents . I have 60 Marines and sailors . I have 300 winter crocheted by hand hats of all warm colors , all sizes. Ready to be shipped. I need assistance in the shipping expense. I’m in San Diego CA. Email….rosiehsuser@hotmail.com let Mr know soon. Thank you. I love that companies want to give gifts to soldiers though I’m not sure what my husband would do with a bag of coffee out there. He has a dfac and no way to make coffee for himself otherwise. I think he’d rather like a taste of luxury again. Something for his skin, feet, hands, sandy eyes, dry lips. I have had Dunkin Donuts (sent 24 bags), Hershey’s and Starkist send items to my son. They were awesome. My son made sure each one of the locations in his battalion received a bag of coffee.